The global increase in and availability and affordability of mobile devices has made them indispensable in day-to-day social networking. Such mobile devices are embraced by young people, giving them a sense of ownership whilst engaging with the devices (Pachler, Bachmair & Cook 2010:3). There has also been an increase in the use of mobile technology to enhance teaching and learning practices (Rambe & Bere 2013; Sharples et al. 2013). Mobile learning (m-learning) has become a new trend in the education sector, with an exponential acceleration in the variety of applications afforded by mobile devices (Aharony 2014:1; Gupta & Koo 2010:75). The American Association of Colleges of Nursing, the National League for Nursing and the Institute of Medicine, major forces in professional health care and nursing education, advocate incorporation of mobile devices in nursing education for integration of theory and practice (George et al. 2010). Handheld technological devices or PDAs (personal digital assistants) were effectively incorporated into nursing education programmes and provided students with a rich resource of reference material that was available and up to date. Almost 80% of students who participated in this study indicated that they successfully used PDAs as an educational resource in both the classroom and the clinical environment (George et al. 2010:371). M-learning is fundamentally defined as 'learning with mobile devices' and has the potential to extend the philosophies of learning through innovation (Gupta & Koo 2010:75). Rushby (2012:355) specifies that research about m-learning can be divided into four areas: pedagogy, administrative issues and technological challenges, ensuring sustainable development in education using m-learning, and the impact of new applications. Thus the possibility of introducing 'learning with mobile devices' to assist students in bridging the gap between theory and clinical practice motivated the need to explore introduction of mobile devices as an emerging technology in the undergraduate nursing programme at a higher education institution (HEI) in the Western Cape Province, South Africa. In a study by Willemse, Jooste and Bozalek (2014:195) third-year undergraduate nursing students and educators participated in a quantitative survey at an HEI in the Western Cape Province. The survey explored and described the perceptions of participants on the potential use of mobile devices in relation to integration of the theory and clinical practice in primary health care (PHC) through m-learning. The study found that 79.8% of the student population were using mobile devices on a daily basis. Students identified the following use of mobile applications on their mobile devices: 9.5% for email, 79.8% for WhatsApp and 75% for Facebook. However, it was interesting that when asked which application was the most suitable for receiving tasks from their educators related to coursework, 76.2% indicated email, 64.3% WhatsApp and 46.4% Facebook. The difference in the results between the two questions identified the need for clarification and deeper exploration of some of the results from the survey. The need to conduct a qualitative study, for example through focus group discussions (FGDs) and individual interviews supported by observational notes, could refine and extend the general picture developed from the quantitative survey completed. A concern emerged amongst educators facilitating a PHC module at an HEI in the Western Cape, South Africa, that their undergraduate nursing students seemed unable to integrate their theory with their clinical practice. It was identified that students refrained from carrying much-needed resource material that could assist them with this integration through research (such as clinical module guides and textbooks) into their clinical environment. Educators agreed that innovative measures had to be researched to assist students with this integrative process, to ensure their continued academic and clinical growth leading to success. The introduction of mobile devices was identified, as it had the potential to become a resource which could assist students to address the problem of needing to have resource material available at any time or in any given place, and to be able to do research on conditions or procedures whilst off campus and in the clinical field (Cook, Pachler & Bradley 2008:3). The aim of the study was to explore and describe the affordances of mobile devices to integrate theory and clinical practice in an undergraduate nursing programme at an HEI in the Western Cape. Explore and describe the knowledge and points of view of students and educators about introduction of new technologies into an undergraduate nursing programme to enhance integration of theory and clinical practice using mobile devices. Identify the affordances of mobile devices with the introduction of new technologies into an undergraduate nursing programme to enhance integration of theory and clinical practice using mobile devices. (c) Registered or provisionally registered as a private HEI under this Act. Mobile learning (m-learning): Koole (2009), as cited in Kenny et al. (2009:77), sees m-learning as resulting from the combination of mobile technologies, the capacity of human learning, social communication, and interaction with the device, the learner and the societal aspects of learning. Herrington et al. (2009:2) argue that in spite of the potential use of m-learning in higher education, it appears to be a mostly instructive, teacher-centred paradigm rather than a more constructivist paradigm. Mobile devices: Mobile devices are associated with small wireless, portable, handheld devices, such as cellular phones, smart phones, PDAs, MP3 players, portable game devices, handhelds, tablets, notebooks and laptops (Kukulska-Hulme & Traxler 2005:2; Traxler 2007:1-12; Wagner 2005:40-53). It is anticipated that the study would contribute to implementation of an original intervention which incorporates mobile devices and m-learning, based on the results of the exploration and description of its affordances into a programme to integrate theory and clinical practice in an undergraduate nursing programme at an HEI in the Western Cape. The affordances of the environment are what it offers the animal, what it provides or furnishes, either for good or ill. The verb to afford is found in the dictionary, but the noun affordance is not. I have made it up. I mean by it something that refers to both the environment and the animal in a way that no existing term does. It implies the complementarity of the animal and the environment. 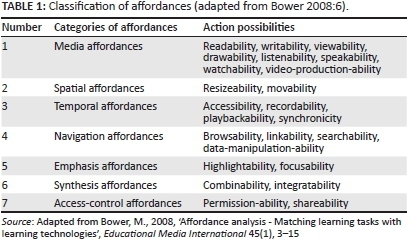 Bower (2008:3) matches teaching and learning tasks with appropriate learning technologies by looking at the action potential of the technology. The dynamic model of Bower (2008:3) enables a better understanding of how teachers identify different kinds of knowledge as valuable in an attempt to support students' ability to learn content knowledge. The categories of affordances of mobile technology provided a framework for the data analysis in this exploration of the affordances of mobile devices in integrating theory and clinical practice in an undergraduate nursing programme. The affordance framework presented in Table 1 defines not only technological affordances, but includes social and educational affordances. The study had a qualitative, exploratory, descriptive and contextual design which provided individual rich data about the phenomena, environment, interactions, meaning and everyday experiences of the participants (Rubin & Babbie 2011:134). The qualitative design explored and describe the knowledge and points of view of students and educators on the affordances of mobile devices to enhance integration of theory and clinical practice in an undergraduate nursing programme.The qualitative data collection methods provided an in-depth understanding through FGDs and individual interviews on the nature of the knowledge and points of view of students and educators on the above topic. The research study was conducted in the context of an undergraduate nursing programme at an HEI in the Western Cape Province. The population of this study included an 'accessible' population, since the researcher had reasonable access to them (Burns & Grove 2005:342; Teddlie & Tashakkori 2009:170). The participants included all third-year undergraduate nursing students (n = 100) registered for the PHC module, a semester module at a university, and their educators (n = 5) who facilitated that module. All members of the accessible population who had volunteered to take part in the study were included in the sample (Hek, Judd & Moule 2003:67). The purposive or selective sampling, a type of non-probability sampling, was a conscious selection by the researcher to include all participants in the study who represented the phenomena being studied (Patton 2002:44). registered for the PHC module (students) or an educator who facilitated the module. In total four FGDs and eight semi-structured face-to-face in-depth individual interviews were held with students, whilst one FGD, one discussion group and three semi-structured face-to-face in-depth individual interviews were held with educators. Initially six FGDs were planned, three from each of the two classes registered for the PHC module, but individuals from both classes withdrew from the study, leaving only enough students for four sessions, two from each class. A total of 10 semi-structured face-to-face in-depth individual interviews were planned with student participants, but after carrying out eight with students and 3 with educators no new or relevant data emerged, and it was evident that theoretical saturation had been reached. This implies that no new or relevant data emerged in the themes or sub-themes and is representative in terms of its properties and to the extent that validation can be confirmed and the relationship between the themes or sub-themes are well established and confirmed (Bryman 2012:421; Kumar 2005:68; Strauss & Corbin 1998:212). Data were collected during FGDs and individual interviews with students, and an FGD, individual interviews, and a discussion session with educators. In the FGD participants are encouraged, in a conducive environment, to share their viewpoints related to the researcher's specific area of interest. FGDs usually include no more than 6-10 participants, which allows everyone in the group an opportunity to participate. The size of the group would depend on how much time is needed to start the discussion, and to ensure that every member is awarded an opportunity to respond (De Vos et al. 2011:360). Focus group sessions were conducted with groups of six participants per group. An individual interview is a data collection method where the researcher conducts interviews with one person at a time (Plano Clark & Creswell 2010:258). These were conducted to enable participants to provide more detail on issues raised during the FGDs. This also provided participants who were not comfortable to share their thoughts within the focus group setting to share their thoughts in a comfortable environment (Plano Clark & Creswell 2010:258). The transcripts of the FGDs and individual interviews held with students and educators, including the discussion session held with educators, were collated for each participant; this provided the researcher with a 'sense' of the text. Participants were invited to review their individual transcripts to confirm the correctness of the transcripts before the data analysis process commenced. Without manipulating the data obtained, they were thematically analysed and categorised into themes in an attempt to collate an accurate exploration and description with regard to the research problem identified (Cook et al. 2008:4). Main themes were identified from the students' FGDs and individual interviews and the FGD, individual interviews, and a discussion session held with educators, as presented in Table 2. The discussion on the findings of this study was guided by assigning affordances to each of the findings with the purpose of creating a meaningful theoretical framework. The themes identified from the thematic analysis of the FGDs and individual interviews concluded with students who participated in the study are henceforth summarised. The affordances of email, WhatsApp and Facebook include readability, viewability, writability, accessibility, browsability, linkability and shareability, whilst WhatsApp and Facebook also include listenability and watchability (Bower 2008:12). The affordances of WhatsApp and Facebook allow students and educators to discuss issues in 'real time' and they are able to share course-related information when in the clinical environment. A depiction of the affordances of email, WhatsApp and Facebook identified is presented in Table 3. Students participating in the study decided to include WhatsApp as a method of communication: 'WhatsApp is the most used under [sic] students at the moment' (Participant 1; FGD 1). Participants clarified amongst themselves that both WhatsApp and emails should be used to communicate 'as a good option' due to accessibility and affordability: 'I think we can use WhatsApp or the social networks, even the emails during our time, breaks, and after work; not during the work time' (Participant 4, FGD 3). Facebook was also indicated as one of the preferred methods of communication, though to a lesser extent than email and WhatsApp. Ivala and Gachago (2012:163) recommend that the daily use of technology, including Facebook and blogs, by students at HEIs could promote student engagement and communication and could lead to improved performance and retention of students. Two students commented as follows: 'And also Facebook ... it's the other ... method of communication' (Participant 2, FGD 1), 'Choose WhatsApp and email . for me Facebook is a social network and for me I would not want the friends I have on Facebook to see my studies' (Participant 1, FGD 1). In terms of the affordability of email, WhatsApp and Facebook, WhatsApp offers the most affordances of a mobile technological intervention. Currently WhatsApp can be regarded as the cross-platform between the instant messaging application and mobile instant messaging (MIM) on smart phones (Church & De Oliveira 2013:352). The study participants of Church and De Oliveira (2013:354) indicated that they sent more messages using WhatsApp compared to SMS, since they were not limited in terms of number of characters and content format on WhatsApp. Participants in this study also perceived their WhatsApp conversations as natural and conversational in nature, with the writing and receiving of messages that provide the sense of an open conversation, as if one was actually talking to a person. The exploration and points of view of students indicated that WhatsApp offered the following affordances (Table 4) which could contribute to the introduction of new technologies for use on mobile devices in an undergraduate nursing programme to enhance integration of theory and clinical practice. The recent dramatic uptake of social networking in education provides an open door for learning, but it could lead to potential challenges. Ethical integrity of both the student and educator is of utmost importance, as is respect for personal boundaries (Aragon et al. 2014:25). Nursing practice requires nurses to assist patients in an attempt to contribute to the health or recovery of the patients in terms of being able to perform unaided actions with the necessary strength, will and knowledge. The practice involves provision of physical and emotional support to the sick, helpless, and wounded (Freshwater & Maslin-Prothero 2005:401; Harris, Nagy & Vardaxis 2009:1301). A participant in a study by Russel, Gentzler and Wood (2014:216) experienced difficulties with changing the culture from traditional record-keeping to the use of mobile technology. Some nurses on duty found using a mobile device difficult. The researcher also summarised the themes identified during the thematic analysis of the FGD, individual interviews and discussion session concluded with educators who participated in the study, as outlined below. Kukulska-Hulme (2010:181) propagates the efficient learning and communication tools of mobile technology by a wider range of students in diverse settings. A research study with secondary school learners shows that their mobile devices afford them mobility to work on an activity in different settings. Participants adopted a notebook computer for the study and they assisted one another when technical problems arose; this could be regarded as a mobile social supportgroup (Gaved et al. 2010:187). Initially there were varied responses to ascertain which method/s of communication would be most suitable for students for augmenting integration of theory and clinical practice. The strongest responses from educators in this regard were the use of (1) email, followed by (2) WhatsApp and (3) Facebook; they ranked these applications in the same order that the student participants did. The affordances thus remained as discussed previously (Table 3). Educators advised that emails should be used as a communication platform to disseminate videos and larger documents to students: 'We can always put attachments on the email or short videos or slides about physiology, especially when it comes to the ears' (Educator 1, individual interview). One educator, however, identified a limitation to using WhatsApp, that is when a student did not have access to an Internet connection. Educators who participated in this study were very enthusiastic about the use of mobile devices to enhance teaching and learning: 'So, the device can actually become like a preceptor or something - shadowing us. Shadowing us; not replacing us, but bringing us closer to the student in the clinical facility' (Educator 3, FGD); 'Because your mobile [phone] is just like a further resource or even a help, if you can say it like that, an educator in ... (our) absence' (Educator 1, individual interview). In a study by Ramos (2008:25) that deals with the use of mobile devices for learning, students express their excitement about m-learning interventions. M-learning and Internet access provide educators with an 'open-door policy' to learning resources from any time zone and any place to apply to their teaching practices (Ally 2009:1). It was emphasised by the educators that students needed guidance whilst in clinical practice: 'I think we need to give them a guideline to develop the case study or the scenario based on that. Our students do still need guidance' (Educator 1, discussion session). Effective learning depends on the abilities of educators to encourage and support collaborative learning (Makoe 2012:94).Affordability and accessibility to m-learning could afford educators a platform to encourage and support collaborative student learning. In an investigation into the pedagogical suitability of using cell phones to enhance learning, Makoe (2010:99) finds that use of social media applications such as Mxit and now WhatsApp allows lecturers to communicate with students and send information at an affordable cost. Ethical approval (12/10/16) for this study was obtained on 12 December 2012 from the Senate Higher Degrees Committee of the Faculty of the Community Health and Sciences, the Registrar and the Director of the School of Nursing at the University where the study was implemented. At an information session prior to implementation voluntary, informed, written, consent was obtained from prospective participants, prior to their involvement in the research project, after the purpose of the study and the expectations of the researcher had been explained. Every participant received a hard copy of the participant information form and the consent form. The participant information form explained the purpose of the study and provided guidelines to participate in the study, an outline of ethical considerations and contact details of the researcher, research supervisor and dean of the faculty should there be any questions later. Participants were informed that they could withdraw from the study at any stage. It was emphasised that there would be no negative consequence or impact on the studies of any student should they decide to withdraw from the study. Lincoln and Guba (1985), as cited in Polit and Beck (2012:583), provide four criteria - credibility, dependability, conformability and transferability - in order to develop trustworthiness in qualitative inquiry. Credibility was conserved in this study through discussion during the engagement with students and educators during FGDs and individual interviews. The steps of descriptive data analysis according to Tesch (1990) were used to identify the major themes of the study. Dependability was ensured through a rich description of the research methodology and data analysis and inclusion of direct quotations from students and educators from the FGDs, individual interviews and the discussion session held with educators. Conformability was ensured through prolonged engagement with participants during FGDs, individual interviews and the discussion session held with educators. Transferability was ensured through inclusion of direct quotations from students and educators from the FGDs, individual interviews and the discussion session held with educators. Effective implementation of m-learning with the use of mobile devices in the undergraduate programme may enhance learning, but it may come up against challenges such as accessibility, connectivity, infrastructure and technical support (Traxler 2007:4). A literature review by Raman (2015:665) indicates that although incorporation of mobile technology within nursing curricula has been studied globally, a diminutive amount of literature exists to address the concerns discovered. There is a need for reflective practice with regard to the various concerns identified about the use of mobile technology, especially within environments with increasing budgetary constraints within clinical facilities. The enthusiasm that students and educators displayed about integration of mobile devices into an undergraduate nursing programme for enhancing integration of theory and clinical practice in the PHC module was promising for the possible success of such an intervention. Participants in this study identified the most suitable applications to assist this integrative process as email and WhatsApp. Throughout the deliberations the majority of student participants indicated that their first preference to use to communicate was email, followed by WhatsApp and then Facebook to enhance integration of theory and clinical practice by incorporating m-learning into an undergraduate nursing programme at an HEI in the Western Cape Province. Information received during data collection indicated that there would be a need for training to ensure that all participants in the study were informed about how to use and thus maximise those modes of communication. Educators would need to receive instruction about how to engage with the communication tools of choice, with the aim of gaining a deeper understanding of the potential application of these tools and their abilities to enable learning, choice, creativity, and self-direction for students. Retrospectively, students should receive explicit objectives for the use of the method of communication, as well as instruction and guidance about how they could best make use of these technologies (Ivala & Gachago 2012:162). This research project was made possible through funding from the National Research Fund. The data for this publication were written up from phase one of the PhD research of J.W. (University of the Western Cape), and the manuscript was written by J.W. V.B. (University of the Western Cape) assisted in her capacity as one of J.W. 's research supervisors and helped with conceptual contributions and review of the draft documents.